With years of experience on our hands, our landscaping team can also educate residential and commercial customers on preventing or ceasing soil erosion or even assist with the installation of irrigation to support a freshly landscaped beatification. If you live in the area, you've probably seen signs for Live Oak Landscapes in Natchez, MS proudly displayed in people's yards. Since 1979, our friendly and experienced team has been serving residents in the Miss-Lou and surrounding areas. 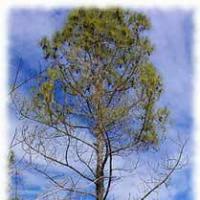 We perform local landscaping and tree services from Brookhaven, MS to Waterproof, LA and all points in-between. We can also do a monthly maintenance program to keep your yard looking great! 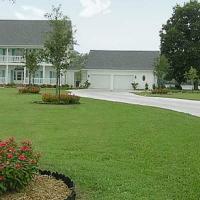 Live Oak Landscapes has worked as both a General Contractor and a Sub-Contractor for a variety of landscaping jobs. From businesses such as the the Natchez Mississippi Visitors Center, Wal-Mart Supercenters, O'Reily Auto Parts Stores, libraries, churches, military housing projects and much more, we can do anything your heart desires! Irrigation is a very valuable process for insuring the the health and long life of your landscape. 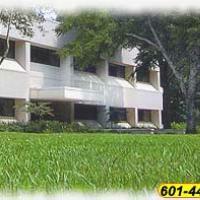 We at Live Oak can create a irrigation plan for any new landscaping we install. We will be able to tell you if you need irrigation and how it could be installed to minimize cost and water usage. We use quality products and experienced procedures to design and deliver a landscape that will be ready when the weather is witheringly dry. Erosion occurs when wind and water work in conjunction to loosen and move the soil. 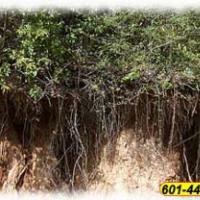 Erosion is a serious problem for anyone who is concerned about the viability and appearance of their property. When erosion occurs, not only does it look bad, but it can cause damage to buildings, fences, or plant life you may have. If gone unchecked erosion can create hazards like sinkholes and foundation problems. Erosion also contributes to polluting local streams, creeks and wetlands. Turfing is the process of preparing the soil to receive seed or sodding, then spreading the seed, laying the sod, or spraying the hydromulch. For many people, a lawn of grass is the largest part of their landscape. 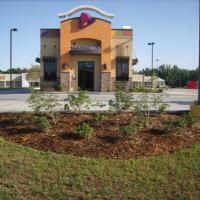 Also grass is frequently used in accent pieces such as small enclaves, medians or along sidewalks.